Users will produce and analyze graphs showing water temperature, salinity, density, and chlorophyll concentration for 2004 at four buoy locations in the Gulf of Maine. The multi-year graph of chlorophyll concentration below serves to illustrate the distinct fall and spring phytoplankton blooms that occur there each year. 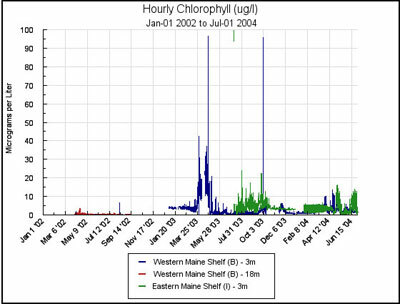 Graph showing chlorophyll concentrations for the Gulf of Maine for 2002-2004. The Gulf of Maine is outlined in the red box in the image below. The image shows chlorophyll levels recorded by the MODIS (Moderate Resolution Imaging Spectroradiometer) sensor onboard the Terra satellite on April 23, 2003. The dark red pixels show areas where chlorophyll levels were 10.0 mg/cubic meter. Gulf of Maine location showing chlorophyll levels recorded by MODIS in April 2003.
identify geographic features in the Gulf of Maine. This chapter demonstrates how oceanographers study the phenomena of the spring phytoplankton bloom using a variety of different oceanographic technologies. 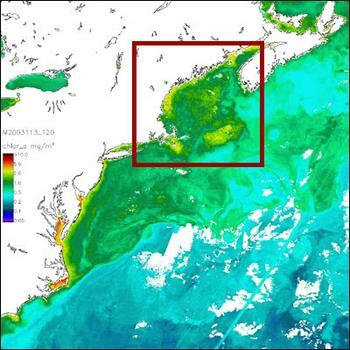 Through understanding some of the basic factors that influence the productivity in the Gulf of Maine, students will be able to make educated guesses about when the spring bloom may occur based on buoy data and satellite images. This inquiry based method will teach students to ask questions in order to solve a puzzle which scientists are also actively trying to answer. Depending on how much explanation and preparation is done for the students, this exercise could involve students from a variety of learning levels. 12ASI1.1 Identify questions and concepts that guide scientific investigations. Students should form a testable hypothesis and demonstrate the logical connections between the scientific concepts guiding a hypothesis and the design of an experiment. They should demonstrate appropriate procedures, a knowledge base, and conceptual understanding of scientific investigations. 12ASI1.5 Recognize and analyze alternative explanations and models. This aspect of the standard emphasizes the critical abilities of analyzing an argument by reviewing current scientific understanding, weighing the evidence, and examining the logic so as to decide which explanations and models are best. In other words, although there may be several plausible explanations, they do not all have equal weight. Students should be able to use scientific criteria to find the preferred explanations. 12CLS4.4 Living organisms have the capacity to produce populations of infinite size, but environments and resources are finite. This fundamental tension has profound effects on the interactions between organisms. In the event that the NERACOOS server is down, or running too slowly to provide the data for a large class situation, you can access cached graphs, from 2004, of chlorophyll, water temperature, salinity, and density for buoys B01, E01, I01, and M01 at the links below. These graphs can also serve as demonstration tools.